Welcome to my new monthly recap series! Whaat? I’m changing up my monthly favourites posts!? Yes I am! I found they were getting a bit stale and boring to write, and frankly I found it tough coming up with enough content for each month to center an entire post about. Instead of only what I’ve been loving, I’ll also share with you my month in photos, plus what I’ve been listening to, what I’ve been watching and a full recap of what I’ve been up to! Let me know if you like the new format in the comments – I love hearing from anyone who reads what I write! San Cisco are a quirky indie pop band hailing from Western Australia who have delivered their long-awaited second album, Gracetown. 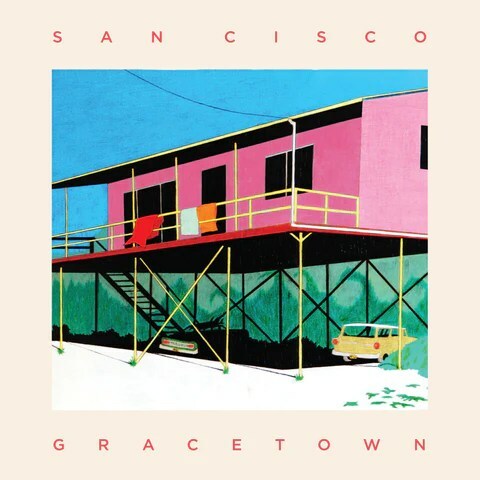 Gracetown is a funky collection of many different styles, all delivered in short songs in typical San Cisco style. From their 2014 hit RUN to their witty, bubblegum pop track Too Much Time Together to more slowed down tracks like Jealousy, the wit, charm and talent of these young Australians will keep you hooked on what is by far my most listened to album of the month. Pentatonix – I had the fortune of not having uni classes when they live streamed their entire concert! I need to see these guys live and meet them, I’m crossing my fingers they come back to Australia soon. Going clubbing – it’s early enough in the semester that I can go out on a Friday night and not feel bad about not staying home to study. I’m definitely enjoying it while I can! Rainymood.com – it’s so perfect for studying when my neighbours are being noisy, and so much better than music since it isn’t as distracting. March was the first full month of uni! I started off the month finally finding the Anatomy textbook I needed (it’s in high demand, it’s hard to find!) and dissecting cow fetuses in my practicals, before falling sick with my first cold for the year, yay! I caught up with old college friends at their new house and jetsetted back home for a weekend to surprise my boyfriend for his birthday! I had my annual neurologist appointment, marking another year of good health news. I began my plant collection for a uni assignment, which had me replacing their papers every single day (which I quickly got sick of). I had my first pub crawl for the year with all the vet students – the theme was “If I wasn’t a vet, I would be…”! I went on a field trip to Charters Towers where we collected bulls’ sperm, collected blood and branded and castrated calves, then partied for St Patrick’s Day that night – needless to say, I was tired. I then spent a week intensely studying for an important anatomy and physiology quiz, which caused major issues (due to it being unclear/unfair etc). Then, I spent ANOTHER week studying for a not-as-important quiz on the 58 different types of worms that can infect animals, yay. I filmed, edited and uploaded my very first YouTube video, showed college spirit at the Intercollege water polo games and filmed my second video, which will go up later in the week!